Historically, the bilateral relations between the Kingdom of Saudi Arabia and the Republic of Cuba date back to 1956. Since that time, the diplomatic ties between the Saudi monarchy and the Cuban government have continued to move towards the two-sided productive perspectives. To reinforce and affirm these relations, Cuba opened its embassy in Riyadh in 2007, and four years later the Kingdom of Saudi Arabia founded its embassy in Havana, 2011. Saudi Arabia wasthe third Gulf country in Cuba, following the opening of thosefromKuwait and Qatar. In 2015, the United Arab Emirates Embassy became the fourth representative of Gulf states in Cuba. These undertakings became a symbol for the governments of these two countries, which anticipate stronger relations in the future. More recently the Foreign Ministers of Cuba and Saudi Arabia, Bruno Rodriguez and Adel bin Ahmed Al-Jubeir, stated their joint interest to expand the economic relations into different fields, thus strengthening the countries’ political ties. The establishment of the Embassy was one of the first steps used to promote Cuba as a great and safe destination for the Saudi population to travel to on a regular basis. One of the milestones of the economic collaborations between Cuba and Saudi Arabia have been the joint agreements, signed within the framework of the Saudi Fund for Development established in 2010. Eightyears later, in 2018, the Saudi Development Fund had implemented fiveprojects in Cuba which are worth 147 million U.S. dollars; including three deals to recover water network across the country. There are several areas where the two countries seem particularly willing to cooperate. These are in investments, tourism, medicine, and technology. The most beneficial of these fields for Saudi investors are medicine and tourism in Cuba. According to the World Health Organization, Cuba is “known all over the world for its ability to train excellent doctors and nurses who can then use their skills to help other countries in need.” Currently, 220 Cuban physicians work and practice in different hospitals of the Kingdom in accordance to the Executive Program of Cooperation existing between the two Ministries of Health. Since the inception of this Program the overall number of physicians, who have worked in the KSA, is above the 500, including nurses and visiting consultants. Many of them have already accomplished their two-year engagement and returned to Cuba, or they are now working in other countries in the framework of different cooperation agreements existing with them. When considering the area of investments, they are beneficial to help develop the country and fill in the existing gaps where the country needs financial assistance. Early in 2008, Saudi philanthropists donated around 50,000 U.S. dollars to aid about 1.78 million Cubans who had been affected by Hurricane Gustav. 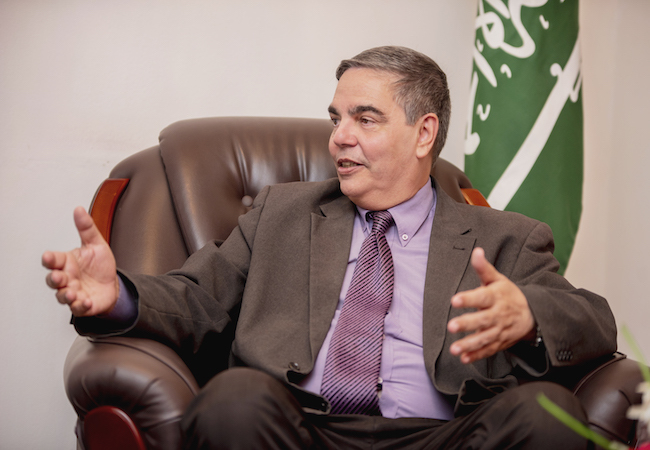 More recently, strong evidence of Saudi support to Cuba was in the form of 26.6 million U.S. dollars that was invested and accepted for the Office of Rehabilitation and Construction Program of the Havana Historian’s Office. This program became the fifth Loan Agreement between Saudi Fund for Development and Cuban Govenrment. The evidence of the cultural ties between Cuban and Saudi Arabia is the Arabian House in the heart of Old Havana. The museum is devoted to Arabian heritage and culture. The museum was inaugurated by then the president Fidel Castro in 1985. Ten years later, a Saudi humanitarian granted 150,000 U.S. dollars to restore the museum. 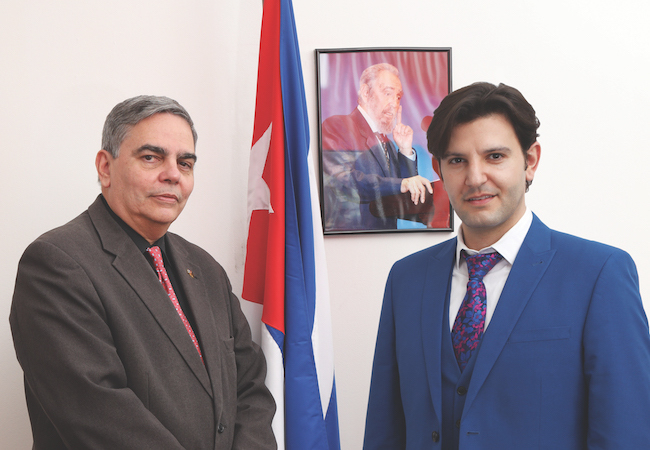 The current Ambassador of the Republic of Cuba to the Kingdom of Saudi Arabia, His Excellency Orlando Requeijo Gual recently commented to the development of Cuba. He stated that financial growth continues to uphold the achievements of the Cuban revolution. His Excellency presented several credential letters asExtraordinary and Plenipotentiary Ambassador of the Republic of Cuba to the Kingdom of Saudi Arabia on 16th April, in 2017. He was also assigned as the non-resident Ambassador of Cuba to the United Arab Emirates, the Kingdom of Bahrain, and the Sultanate of Oman. The Ambassador underscores the fact that the Cuban economy, based on the volume of sugar, has transformed into a service-based economy. 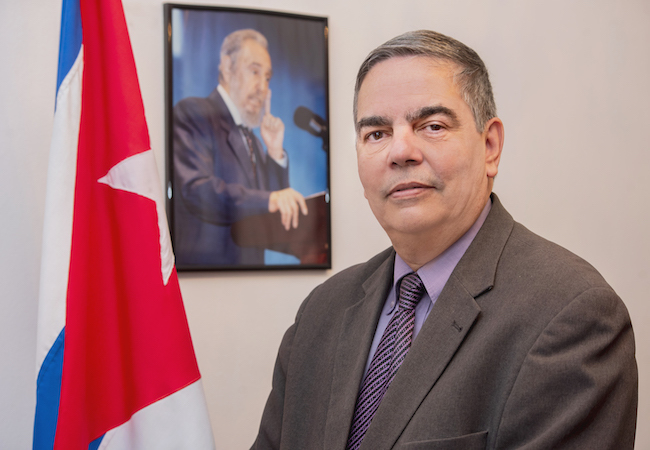 Previously, His Excellency was assigned as Deputy Permanent Representative of Cuba since August 2001 till December 2003 to the United Nations. Hereafter, he was appointed as the Permanent Representative of Cuba to the United Nations, and served since January 2004 till November 2005. Before the appointment as the Head of the Mission to Saudi Arabia, H.E. Orlando Requeijo Gual has served as the Ambassador to the State of Qatar, France, and the Principality of Monaco. He often acknowledged the neo-liberal policies, agricultural subsidies, and extensive military spending as the cause of global inequality. The Ambassador has often stated that he greatly appreciates the development and increase of the economic conditions in Cuba through the continued advance of knowledge, research, and education. I had a great opportunity to sit down with Ambassador Orlando Requeijo and talk about relations between Cuba and Saudi Arabia. A.W. On April 16th, in 2017, King Salman bin Abdulaziz Al Saud, the Custodian of the two Holy Mosques and the King of Saudi Arabia, received from you, Mr. Orlando Requeijo Gual, the credential letters as the Extraordinary and Plenipotentiary Ambassador of the Republic of Cuba to the Kingdom of Saudi Arabia. Please discuss your measure of commitment to the expression “Extraordinary and Plenipotentiary Ambassador”? Amb. O.R.This is a formal recognition of an Ambassador’s power, granted to the leader by the Head of State, to represent him/her before another Head of State and discuss issues of bilateral importance on his/her behalf. Of course, this is a significant responsibility for an Ambassador to exert his/her functions with the host authorities. A.W. An objective approach can be the beginning of mutual confidence and a requirement for a productive and fertile bilateral relationship between two countries. How would you evaluate the bilateral relations of Cuba and Saudi Arabia in terms of efficiency? What are the gaps that need to be improved? Amb. O.R.The bilateral relations between Cuba and Saudi Arabia are on a very energetic track. However, there are still many avenues to explore and enhance, for the mutual benefit of the people of both States, according to their respective strengths and capabilities. However, it seems it is necessary to have additional exchanges to increase the mutual knowledge and to further develop our bilateral links. This challenge that can be resolved when both parties sit down and work to understand their differences and reach a mutual understanding of the vital issues. A.W. During your meeting with the Minister of Foreign Affairs of the Kingdom of Saudi Arabia, H.E. Mr. Adel bin Ahmed Al-Jubeir you expressed your willingness to strengthen and widen the connections between these two countries. Where do you see the potential for growth and escalation of state relations? Amb. O.R. In 2017, the VicePresident of the Cuban Government, Mr. Ricardo Cabrisas, made an official visit to the KSA where he was received in Jeddah by His Majesty King Salman bin Abdulaziz. More recently, in April 2018, Foreign Minister Adel Al-Jubeir was greeted in Havana by, then Cuban President Raúl Castro. Both visits were a clear signal of the mutual willingness of both countries to expand their bilateral relations in different fields. This visit is a duty performed by the respective diplomatic representatives in each capital. A.W. 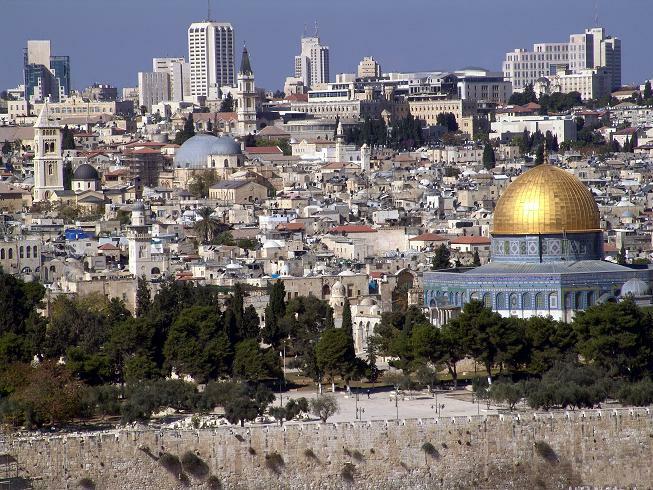 Historically, each country has its own leader who is considered a hero of the ages. King Abdulaziz became this leader and the lighthouse of the Saudi people, while Fidel Castro became the hero for the Cuban people. Can you discuss the most important legacy that these two leaders left to new generations? Amb. O.R. I can unequivocally say that both leaders left a valuable legacy to generations of people from their countries. Their work can be measured in such areas as self-recognition, sovereignty, pride, and unity. They were also models of tenacity and confidence in their victories despite the difficulties and obstacles that they often faced. They were challenged by external and internal factors. However, their desire to forge an independent life for their nations without foreign interference helped them to persevere and overcome all obstacles. A.W. You were assigned to the position of Permanent Representative of Cuba to the United Nations since January 2004 till November 2005. What were the core values, learned while at the UN? Can you discuss your understanding of the expression “united nations”? Amb. O.R.The members of the United Nations, the body that maintains international peace and security have a common goal. The core value of mutual respect between people and nations helps to foster cooperation to solve economic, social, cultural, and international humanitarian problems. Since the world leaders frequently gather, their goals are the same despite the distances of their locations. They believe that each person deserves peace and stability, environmental stability, a world free of deadly diseases, and equality regardless of race, gender, and religious beliefs. Although this has been the message of the international community for many years, their goals are often put in danger by the behaviors of some nations. A.W. In your statement as the Permanent Representative of Cuba to the United Nations, you mentioned the importance of women as the key players, particularly in “the implementation of policies.” What is your vision for women empowerment in different positions? Amb. O.R.Many people believe that there are not many differences between the way men and women do their jobs; both are completely capable of performing their duties. Although there may be biological limitations in some cases, physical ability is often a result of another person’s perception. Most jobs can be done by both, but cultural factors often come into play in the workplace. Of course, customs are different in every country and culture and traditions are also different around the world. Different countries are faced with a variety of issues and certainly have different thoughts on equality. In Cuba, there are women in high positions; of which three are serving as vice presidents. Gladys Bejerano, Inés María Chapman, and Beatriz Johnson were assigned as the Vice Presidents in July 2018. Additionally, we have several women ministers, and more than a half of the Parliament members are women. The majority of doctors, scientific researchers, teachers, and professors in Cuba are women, and they are enthusiastically accepted. In fact, women have always been better students than men at all levels of achievement. Therefore, it is not surprising that their performance is also better. It is essential to understand the cultures of other countries, and how equality is changing globally. A.W. The collaboration between Cuba and the Saudi Development Fund began in 2010. Since that time, how has the mutual diplomatic and economic partnership level increased? Amb. O.R.We have accomplished a very sound relationship with the Saudi Development Fund is a clear example of hard work on both sides. 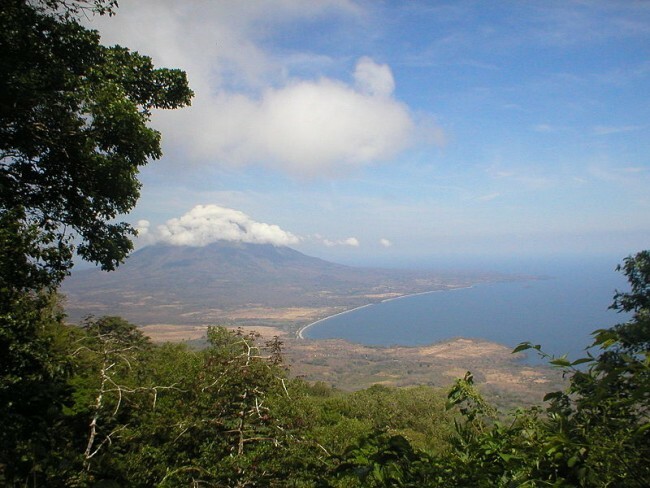 The Fund has executed five different projects in Cuba. These include the rehabilitation of a pediatric hospital, social service programs in Old Havana City, along with three other projects improving the water systems in the cities of Havana, Camagüey, and Cárdenas. There are other projects in the planning stage. Two new water supply projects submitted for approcal, as well as a credit line facility to introduce Saudi products to the Cuban market. Furthermore, a grant has allowed the planning to begin on the construction of King SalmanHavana Mosque within the next few months. A very cordial relationship exists between the countries, and each side is working hard to get to know the people, the policies, and the traditions of each country. Alexander Woodman is a faculty member of College of Science and Humanities at the Prince Mohammad bin Fahd University. His research interest includes global health, international health policy development, transnational and transcultural health politics, medical ethics as well as international diplomacy.